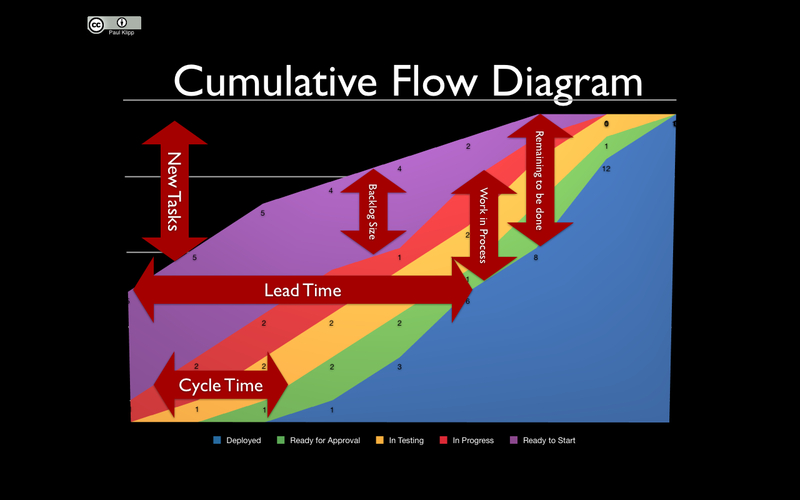 Cumulative Flow Diagrams are a wonderful tool to see trends and find bottlenecks in your delivery process. 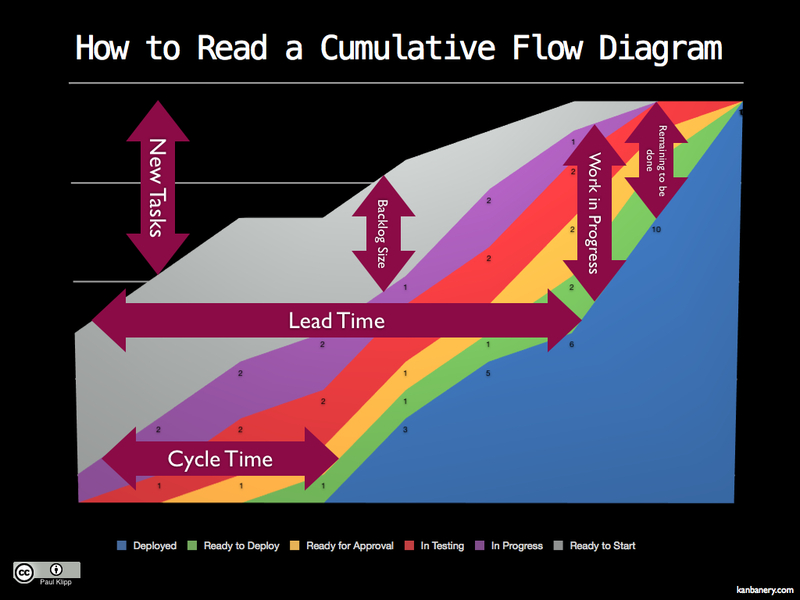 They are often used in Kanban environments. 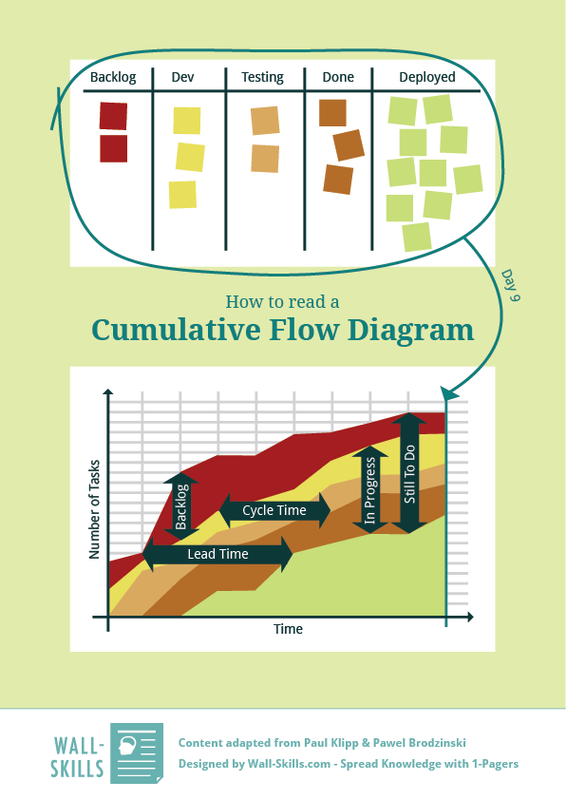 We adapted the 1-pager from images by Paul Klipp and Pawel Brodzinski. If you’d like to know how to spot various problems with CFDs, check out Pawel’s article. maybe because we already have items in done? and some have 0 work in them? The numbers simply represent how many cards are in that phase for the given date. Would love your advice on how to tackle CFD’s for my team. Disclaimer: My experience with CFDs is limited. I’ve plotted them long-term on 3 occasions AFAIR. Maybe someone else can provide more insight. I’m not sure what you mean by “ugly”. The disconnected orange lumps? I’ve plotted CFDs like that and as long as the represented numbers are small I don’t see a problem. I.e. if something goes 1 – 0 – 2 – 0 – 1 that’s okay. 10 – 0 – 14 – 0 indicates lumpy workflow and could be a problem. If it was my team I’d be more curious about why the backlog is growing. [x] Fixed! Thanks for the hint, Paul!